Enhanced with detailed checklists and a wealth of practical and flexible auditing tools on CD–ROM, this book provides an ideal resource for new and future laboratory personnel, and an excellent means for keeping existing industry practitioners up to date on the nuances of operating a consistently compliant pharmaceutical laboratory. 1. INTRODUCTION TO THE QUALITY SYSTEMS APPROACH TO CGMP COMPLIANCE. 1.1 Overview of Quality Systems. 1.2 Quality Systems and Compliance with CGMPs: Reasons for Auditing Your Laboratory. 1.3 Goals of Auditing Your Laboratory. 1.5 Integration with Existing Programs. 1.6 Modifiable and Scalable Approach. 2. PREPARING FOR THE AUDIT. 2.2 Audit Tools and Templates. 2.2.1 Goals of the Audit. 2.2.2 Review of the Audit Process. 2.2.3 Laboratory Audit Form (LAF) Generation Process. 2.2.4 Subelement Audit Strategy Development. 3. AUDITING AND DATA CAPTURE. 3.1.1 Data Capture and CGMP Deficiency Documentation. 3.1.2 Use of Random Statistical Sampling to Improve the Efficiency and Overall Audit Quality. 4. ORGANIZING DATA AND REPORTING THE RESULTS. 4.2 Format and Content of the Audit Summary Report. 4.2.7 Laboratory Controls Subelement Sections. 5. DEVELOPING AND IMPLEMENTING A CORRECTIVE ACTION PLAN. 5.2 LAF–to–CAPA Workflow Diagram: Converting Example Audit Findings to Example Corrective and Preventive Actions. 5.2.1 Step 1 Audit Finding Notebook Entries. 5.2.2 Step 2 Formal Documentation of Finding or Deficiency on LAFs. 5.2.3 Step 3 Common Root–Cause Correlation by Management. 5.2.4 Step 4 LAF Linkage to System Deficiencies. 5.2.5 Step 5 Management Assignment of Corrective Actions to Address System Deficiency. 5.2.6 Step 6 Work Breakdown Structure (WBS) Is Generated. 5.2.7 Step 7 Corrective Action Project Plan (CAPP) Created From WBS and Executed. 5.2.8 Step 8 Corrective and Preventive Actions (CAPAs) for System Deficiencies. 6. DEVELOPING AND IMPLEMENTING A VERIFICATION PLAN. 6.2 Corrective Action Verification Process. 6.2.1 Step 1 Action Owners Work with Corrective Action Team to Design and Implement Systems–Based Corrective Actions. 6.2.2 Step 2 Corrective and Preventive Actions Are Implemented. 6.2.3 Step 3 In–Use Data for Implemented Corrective and Preventive Actions Are Generated. 6.2.4 Step 4 Action Owners Working with Corrective Action Team Create Preverification Packages for Verifiers. 6.2.5 Step 5 Verification Team Leader Schedules Verification with Verifiers, Action Owners, and Functional Area Managers. 6.2.6 Step 6 Verifiers Review Preverification Packages. 6.2.7 Step 7 Verifiers Generate Verification Plans. 6.2.8 Step 8 Verifiers Meet with Action Owners as Scheduled by Corrective Action Team Leader. 6.2.9 Step 9 Verifiers Begin Verifying Corrective and Preventive Actions in the Functional Area. 6.2.10 Step 10 Verifiers Determine Whether Action Is Verifiable or Not Verifiable. 6.2.11 Step 11 Verifiers Create Verification Report. 6.2.12 Step 12 Verification Team Leader Schedules Verifiers to Present Findings Before the Verification Review Board. 6.2.13 Step 13 Verifier Forwards Verification Report to Verification Review Board for Review. 6.2.14 Step 14 Verifier Presents Report to Verification Review Board. 6.2.15 Step 15 Verification Board Determines if the Action Is (1) Verifiable, (2) Not Verifiable or, (3) Verifiable Pending In–Use Data. 6.2.16 Step 16 Verifier Modifies or Corrects Verification Report as Necessary on Verifiable Actions. 6.2.17 Step 17 Verifiable Actions are Closed by Action Owner, Corrective Action Team Leader, and Verification Team Leader. 6.2.18 Step 18 Nonverifiable Actions Are Sent Back to Action Owner for Additional Work. 6.2.19 Step 19 Verifiers Reverify Uncompleted Actions When Scheduled by Verification Team Leader. 7. DEVELOPING AND IMPLEMENTING A MONITORING PLAN. 8. 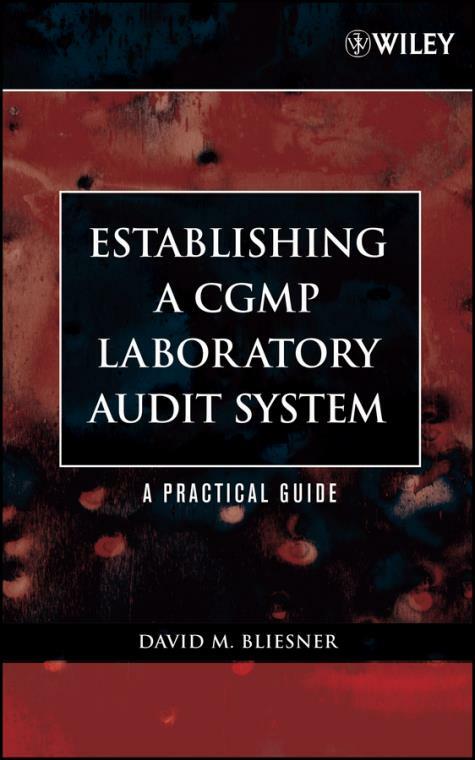 A SUMMARY FOR ESTABLISHING A CGMP LABORATORY AUDIT SYSTEM. 8.1 A Brief Review of the Guide. 8.2 Additional Lessons for the End User. 8.2.2 Applicability to Your Facility. 8.2.3 The Value of Systems–Based Solutions. 8.2.4 No Immunity: Every Laboratory Is a Potential Compliance Accident in the Making. 8.2.5 Audits as Learning Tools. 8.2.6 The Linkage Between Ownership and Success. 8.2.7 Compliance Is Good Business. APPENDIX I. EXAMPLE AUDIT CHECKLISTS: LABORATORY SUBELEMENTS. APPENDIX II. EXAMPLE TEMPLATE FOR AN AUDIT SUMMARY REPORT. APPENDIX III. GLOSSARY OF CGMP AND AUDIT SYSTEM TERMS. APPENDIX IV. FDA COMPLIANCE PROGRAM GUIDANCE MANUAL 7356.002 "DRUG MANUFACTURING INSPECTIONS". 21 CODE OF U.S. FEDERAL REGULATIONS PARTS 210 AND 211 CURRENT GOOD MANUFACTURING PRACTICE REGULATIONS.